As the science interpreter for the sanctuary, Nancy works with outreach/education and science staff to develop materials and share information about scientific research related to managing the sanctuary’s natural resources. When not participating in an interagency committee meeting, staffing an outreach booth, or giving a slide presentation, Nancy is busy developing Science Summaries and other materials designed to communicate research results to interested stakeholders. She also manages the Florida Keys section of the sanctuaries’ online media library featuring photographs of marine life, maritime artifacts and people who live and work in the sanctuary. After growing up in the south Florida sun, Nancy earned a Bachelor of Science in biology and Master of Science in zoology from Virginia Tech. During the first few years after college, Nancy was employed as a marine science field instructor, a naturalist for Miami-Dade Parks, and a marine science high school teacher. Nancy moved to the Keys in 1993 and shortly thereafter began working as a biologist with Florida Wildlife Research Institute where she helped investigate the algae blooms persisting in the bay. 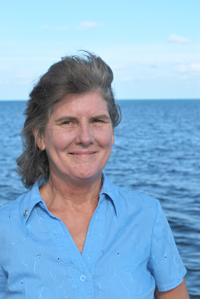 Prior to joining the Florida Keys National Marine Sanctuary’s education and outreach team in 2000, Nancy was the Florida Bay educational liaison for Florida Sea Grant. Nancy was first inspired by the coral reef on a snorkel trip to Looe Key Reef with her high school marine biology club. Throughout her life, Nancy has loved learning about the marine world and sharing her knowledge and curiosity with others.